Award winning small business owner and advocate for women in the construction industry, Tammy Stanton, has launched ‘Women in Power’, a not-for-profit association helping to advance the progress of women in construction. Through the Women in Power initiative, Tammy is undertaking motivational speaking at women’s construction events across the country. 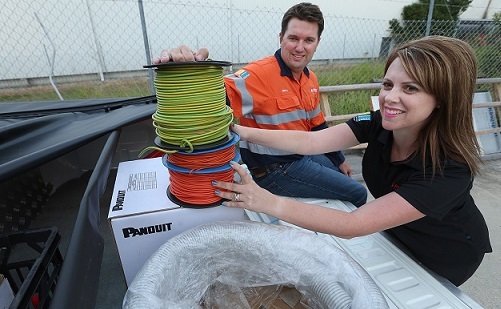 Tammy, who co-owns Platinum Electricians Morningside in Brisbane with her husband Barry Stanton, was inspired to play a greater advocacy role in the industry after winning 2015 Construction Female of the Year at the Construction Skills Queensland (CSQ) Excellence Awards. “Winning the CSQ Excellence Award has opened the door to new opportunities as a spokesperson and figurehead for young women who are interested in entering the industry. I am grateful to have been given this platform to influence a new generation of young women who are confident and hungry to learn,” said Tammy. “I never thought of myself as an agent for change before now. I’ve been told I’m passionate but that just comes with owning your own business,” she said. With a degree in IT and an MBA, Tammy recently returned to her studies to complete a Certificate III in Electrotechnology so she could better understand her business. “I am always learning and searching for new and innovative ways to improve the company. We recently hired our ninth tradesperson and we are looking to grow the business to a group of 12,” she said. Construction Skills Queensland (CSQ) is an independent industry-funded body supporting employers, workers, apprentices and career seekers in the building and construction industry. As a recognised industry leader, CSQ’s mission is to promote the building and construction industry as a career of first choice, encourage investment in skills and training and increase the number of skilled workers in the industry. For more information about careers in the construction industry visit the website www.csq.org.au.